All of the following was examined in January 2011. 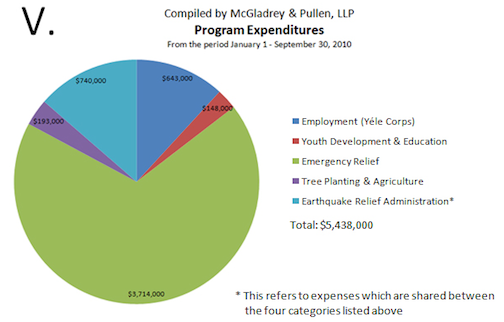 Yele reports expenses in broad categories (e.g., allocated to "emergency relief");4 we have not found a more detailed breakdown. Yéle also reported in detail a list of supplies provided to earthquake survivors.5 It is not clear whether these outputs represent all of Yéle's activities. Yele reports to running programs in Haiti for emergency relief, employment, youth development and education and tree planting and agriculture. We have reported on the information available about these programs above. New York Times. Star's Candidacy in Haiti Puts Focus on Charity. http://www.nytimes.com/2010/08/17/world/americas/17haiti.html (accessed January 11, 2011). Archived by WebCite® at http://www.webcitation.org/5vfK8Ik4i. Yéle. About Us. http://www.yele.org/about_us (accessed January 4, 2011). Archived by WebCite® at http://www.webcitation.org/5vVMSEHuG. Yéle. Employment. http://www.yele.org/what_we_do/employment (accessed January 4, 2011). Archived by WebCite® at http://www.webcitation.org/5vVMlLTJJ. Yéle. Financial info. 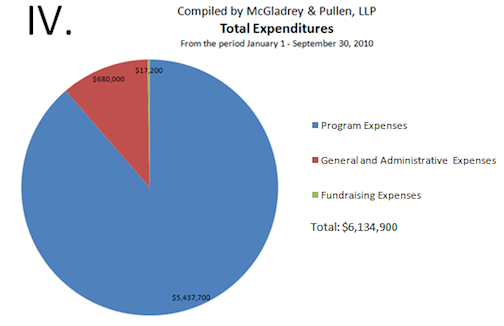 http://www.yele.org/about_us/financial_info (accessed January 10, 2011). Archived by WebCite® at http://www.webcitation.org/5vdMDbwNh. Yéle, Homepage. http://www.yele.org/ (accessed January 11, 2011). Archived by WebCite® at http://www.webcitation.org/5vexGMMcO. Yéle, Media. http://www.yele.org/media/newsroom (accessed January 11, 2011). Archived by WebCite® at http://www.webcitation.org/5vexK2R5t. Yéle. Nutrition for Kids. http://www.yele.org/what_we_do/tree_planting_and_agriculture/nutrition_f... (accessed January 4, 2011). Archived by WebCite® at http://www.webcitation.org/5vVMtt9gA. Yéle. Progams. http://www.yele.org/what_we_do (accessed January 11, 2011). Archived by WebCite® at http://www.webcitation.org/5vexNfrG5. Yéle. Tent to Tent Distribution of Soap Begins in Haiti. http://www.yele.org/what_we_do/emergency_relief/cholera_response (accessed January 4, 2011). Archived by WebCite® at http://www.webcitation.org/5vVMUOSUL. Yéle. Tents. http://www.yele.org/what_we_do/emergency_relief/tents (accessed January 4, 2011). Archived by WebCite® at http://www.webcitation.org/5vVMfY3kg. Yéle. Tree planting and agriculture. http://www.yele.org/what_we_do/tree_planting_and_agriculture (accessed January 4, 2011). Archived by WebCite® at http://www.webcitation.org/5vVMreMb9. Yéle. Yéle Haiti Helps to Rebuild Haiti, As the Six-Month Anniversary of the Earthquake Passes with so Much Still to be Done. http://www.yele.org/media/newsroom/18 (accessed January 4, 2011). Archived by WebCite® at http://www.webcitation.org/5vVMwjz6o. Yéle. Yele Haiti Partners with Medishare to Bring CT Scanner to Haiti http://www.yele.org/what_we_do/emergency_relief/yele_grants (accessed January 4, 2011). Archived by WebCite® at http://www.webcitation.org/5vVMieT2B. Yéle. Yéle supplies for tent camps. http://www.yele.org/what_we_do/emergency_relief/supplies_for_tent_camps (accessed January 4, 2011). Archived by WebCite® at http://www.webcitation.org/5vVMXvZMP. Yéle. Supplies to tent camps since the earthquake (PDF). “As of May 31, 2010, Yéle has raised more than &dollar;9 million for relief activities and has spent approximately &dollar;1.5 million on the following programs: water, food distribution, Haiti Community Network, orphanages, shipping and distributing relief materials, shelter and Yéle Corps.“ Yéle, "Yéle Haiti Helps to Rebuild Haiti, As the Six-Month Anniversary of the Earthquake Passes with so Much Still to be Done." 'The earthquake raised the musician's profile and brought his small nonprofit group more than &dollar;10.5 million through July 31, of which just under a third has been spent, according to the charity.” New York Times, "Star's Candidacy in Haiti Puts Focus on Charity." 2,500 solar radios (donated by Eton through the efforts of Timberland)."